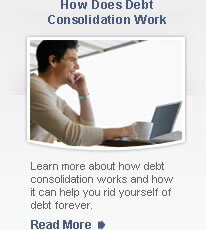 Understand the fundamentals of debt consolidation and the options available. 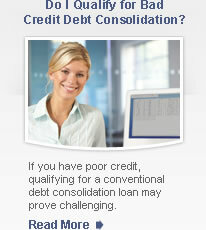 Discover the benefits of debt relief programs and whether they're right for you. 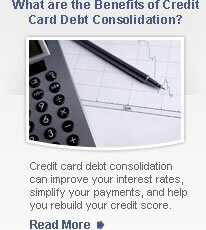 Get practical advice on managing your debt and taking control of your finances. 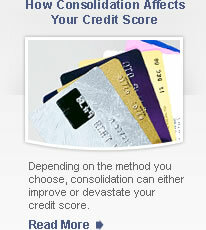 From types of debt to understanding your credit rating- learn debt basics here. Are you overcome by debt? Do bill collectors leave more messages on your machine than your friends & family? Are you ready to say, "enough is enough" and take back control of your financial situation? If so, No Debt Today is here to help you reclaim financial freedom by offering you the internet's most trusted, free debt consolidation program options since 1997. If you're interested in taking advantage of our services or you would like to learn a little more about what we have to offer you, simply choose the type of debt consolidation program you need from the list to the right. After you've determined which program best fits your situation, use the form located on the top of every page to get your free online debt consultation. There's no obligation to commit today, and you can take as much time as you like to consider your debt settlement options. Credit card consolidation can help you significantly reduce monthly payments or bundle them into one convenient bill, no matter how much you owe. Debt settlement / debt negotiation works with your creditors to negotiate your total balance down to a more manageable level. Debt management services assist you with learning materials, tools, and other helpful resources to help you stay on top of your debt for good! We specialize in helping people all over the country work with creditors to resolve outstanding debts, and we take great pride in being the final step most individuals take toward becoming debt free. Our unique debt help program takes your unique financial situation into consideration while offering options for things like an easy-to-manage, affordable monthly payment; this ensures that you are consistently paying down your debts without breaking the bank each month!